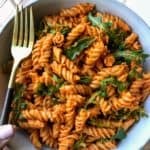 This Roasted Red Pepper Romesco Sauce will take your pasta dishes to the next level! You all are going to love this roasted red pepper romesco sauce. I basically wanted to take a bath in it because it is that good. When I was home last weekend, I wanted to make dinner for my dad because my mom was going away during the week and I figured I would help set him up with some meals. My dad is a pasta and red sauce kind of guy. I’ve talked about it before but he is a simple man. He is the kind of guy who will order vanilla ice cream at a fancy 32 flavor ice cream shop. His college days were filled with peanut butter and jelly and a can of peas. Those of you who know my dad wouldn’t be surprised by this at all. I’ve been trying to spruce up his meals with each and every day that passes and you guys, he has LOVED them all! It has been so fun adding new things to his diet. He is such a good sport and will try anything that I made. Vegan cheese? He’s the first one to take a bite. Dairy-free yogurt? He’s got a spoon. So in an effort to continue on that path, I made him a different version of a typical “pasta + red sauce”. And the verdict? He looooved it and raved about it. Little did he know this sauce was completely vegan and loaded with nutrients. Blend all ingredients in a blender or food processor until completely smooth, scraping down sides as needed. Taste and adjust spices as preferred. Spread over pasta, toast, as a dip – the opportunities are endless!